Ethel M. Rice with illustrations by Albert Kay/ published 1939 by Sam Gabriel Sons & Co.
My son had never seen Wiggle and Waggle until last night at bedtime, and one read-through led to a small tantrum to read it again…and again… and again. Mom says this copy actually belonged to her sister, but that it passed between them on regular rotation all the same. I love the illustrations… the adorable kitten and the dopey-faced pup, but it’s the super sweet storyline that gets me every time. 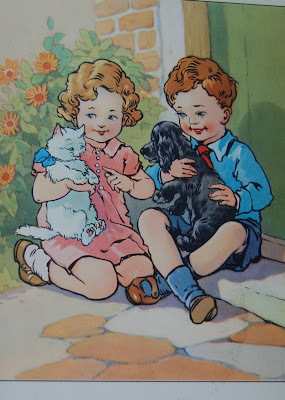 This is the story of Wiggle, the Cuddley Kitten who was all white and soft and roly-poly, and Waggle, the Pedigree Pup, who was all black and shiny and waggley, and of how they started out to find the nicest place in the world, and really truly found it! The two do a barnyard poll looking for the most delightful spot in all the universe… But for the curious pup and his kitten friend, ultimately, there’s no place like home. I’m so psyched to be getting my hands on all these books from my mom’s collection, especially since most of them were her childhood favorites. The only one of her original collection that I have at home is Billions of Quacks… which is AWESOME… but the books from this era are all really bright and touching. The best part is imagining my mom when she was small, snuggling up in her bed and getting an eyeful of all these cute creatures.